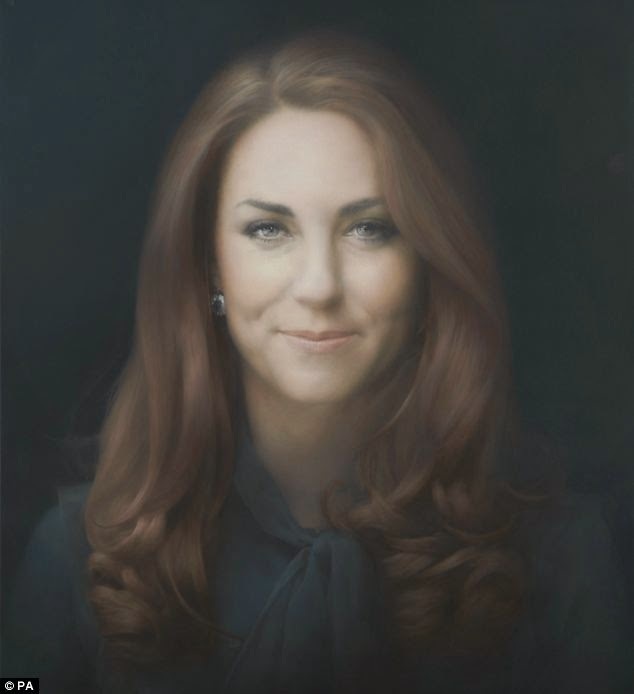 "... as the Duchess of Cambridge’s first official portrait was unveiled to the public yesterday, art critics were, unusually, largely united in their condemnation. ‘Ghastly ... rotten ... an out and out disaster,’ was the view of the editor of the British Art Journal, Robin Simon. ‘It’s only saving grace is that it’s not by Rolf Harris,’ was the best that David Lee, now editor of The Jackdaw and a former editor of Art Review, could manage. This is my response to Paul Emsley (a 2007 winner of the National Portrait Gallery BP Portrait Award for portrait painting) who took three months and a half to do "this." It took me one week to do mine YET always have been refused to even be part of this National portrait gallery so-called "competition" ! For the record: I am a Republican in the tradition of a Thomas Paine, I am not a monarchist. I therefore consider monarchy as an institution belonging to the past and should remain there. Although I disagree politically with the institution, I respect persons such as Kate Middleton. In my paintings I always focus on the personality of the subject and try to avoid the distraction of pomp and 'perfection' attached to an officially commissioned portrait. My portrait's title is 'Expectations' as there are so many, and at different levels, from those of a future mother and beyond. I therefore find painting her "branded smile" to be inappropriate, from my perspective. Hence the title, because many "expect" so much from a portrait! I dared painting her as a real person. If it is a crime, I apologize. Kate Middleton and Prince William left St Mary's Hospital on July 23 with the royal baby boy in tow. 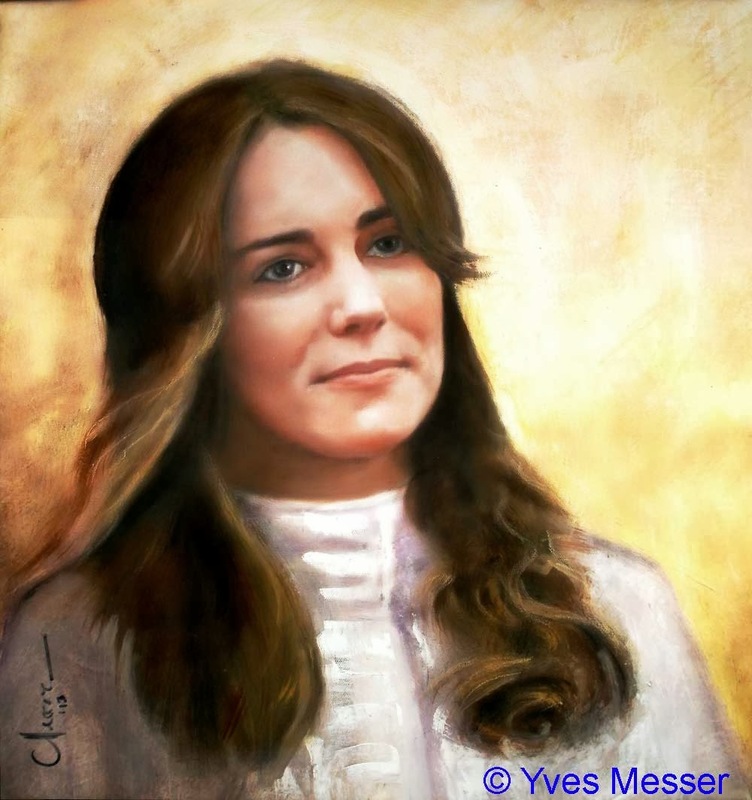 Watching live, I was amazed by how much Kate Middleton looks like the portrait I did in mid-May. I called it "Expectations" adding a sunny background since I painted with that day in mind. Yes the day the baby was born was sunny and once she appeared outside of the hospital with him, she looked so much like my painting, especially her hair (for which some harshly criticized me). I was right, my critics were wrong. PS: I am not a psychic. Both portraits are the REAL her! The first one you can see how he was thinking how preposterous the whole official portrait thing is and in the second which is the beginning of her pregnancy you can still see how she is still feeling her way in the new world she waited 10 years to get entry into.She still doesn't feel content yet. well, it sounds like the ego of another artist. Good on the royals for being so polite, as I would have asked for his head. when you say "the artist" or "he", who are you talking about? (we have names btw), especially if you ask "for his head"! I honestly love your painting so much more than the other. It looks like you captured her as a real person, someone that actually thinks and hopes and feels. I just think the other is the face of a woman who has to put on a "public face",artificial and cold. Thank you. 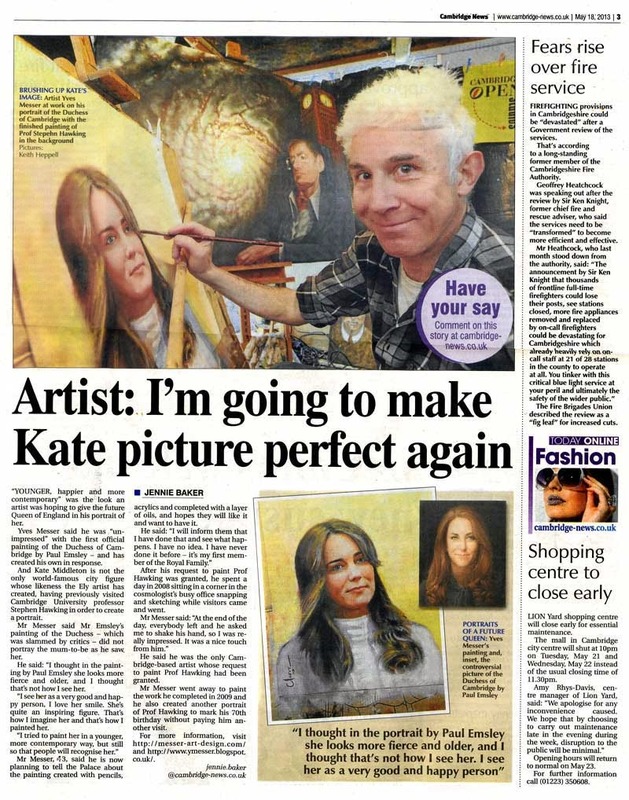 I wrote exactly that to The Duchess : "In my paintings I always focus on the personality of the subject and try to avoid the distraction of pomp and 'perfection' attached to an officially commissioned portrait. I hope I have succeeded in a fair rendering of your personality. I have attempted to paint you in the way I think most people in the country see you. The portrait's title is 'Expectations' as there are so many, and at different levels, from those of a future mother and beyond." I hope she liked as much as so many of us do :) You have amazing talent. Thank you Kristi. Me too hopes she does. June 11. Received an official thanking letter from Kate Middleton's private secretary for my portrait.